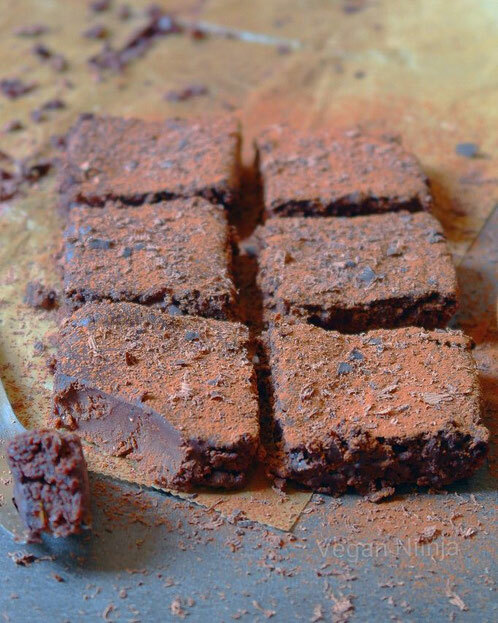 Chocolate Brownies made with Chickpeas - simply & healthy vegan recipes that taste amazing! Melt the chocolate in a bowl placed over a pan filled with hot water. Blend the chickpeas, nut butter and the coconut oil for some minutes in a high speed blender before adding all the other ingredients. Add the melted chocolate and blend until smooth/well combined (for at least 5 minutes or until the mixture is very smooth. Heat the oven to 180°C and let the brownies bake for about 25 minutes. (Note: if you double the recipe, heat the over to 175°C and bake for 30 minutes!) Be careful to not bake the brownies to long, then they will get to dry. Let the cake cool down before slicing it into cubes. *Note: you can use butter beans and chestnut puree instead of chickpeas and instead of nut butter you can use coconut butter. It works really good and is perfect if you have some allergies. Die Schokolade in einem Wasserbad schmelzen lassen. Die Kichererbsen, Nuss-Mus und das Kokosöl in dem Mixer kurz pürieren, dann die andere Zutaten dazu geben. Teig in die mit Backpapier vorbereitete Form füllen und auspressen. Brownies herausnehmen und vollständig auskühlen lassen. In Stückchen schneiden und genießen! *Bemerkung: du kannst die Kichererbsen mit Limabohnen und Kastanienpüree ersetzten. Und statt Nuss-Mus kannst du auch Kokos-Mus verwenden. Das Rezept kannst du sehr leicht an Allergien anpassen. Leave a comment below - I answer will answer your comment soon! I love to get your feedback! Great, thank you so much :) I can't wait to make them! Looking forward to your feedack!